Before Internet, when one wished to purchase a puppy they were, for the most part, limited to buying locally. Things have changed; the world now relies on the Internet for so many things. People can research the different breeds; a world of options has opened up to be almost endless. This has also opened up new opportunities for scams. You have decided to bring a new pet into your home; you have researched and read up on all of the pets traits. Next you need to find a breeder, rescue or someone who has what you are looking for.You have decided to bring a new pet into your home; you have researched and read up on all of the pets traits. Next you need to find a breeder, rescue or someone who has what you are looking for. Most good breeder listings do their best to weed out scams. Granted, they don't always catch the scammers. Ads for scammers do run in the best breeder listings from time to time, but are removed as soon as the scammer is detected. The scammer opens up the ad page with a stolen credit card and it can be very hard to tell that the credit card has been stolen. 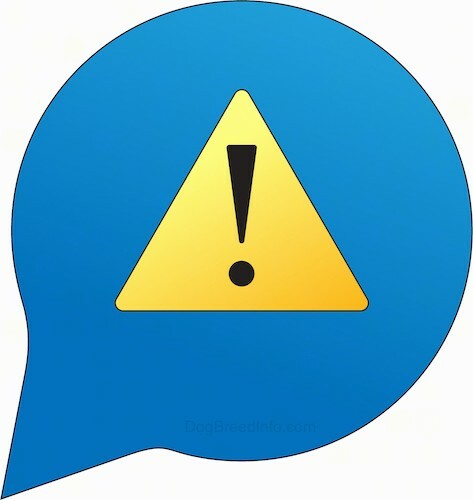 Be extra cautious of ads found in free classified ads (sites where it is free to post an ad). One does not have to avoid sites that run free listings, as there are plenty of legit ads on them, however do be extra cautious, as scammers feed on free places to find their prey. 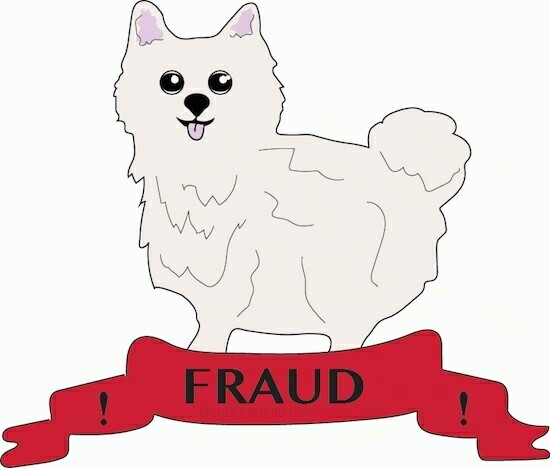 A lot of these scammers create a website or classified ad page to sell their so-called "puppies." They steal images and text off of actual breeder websites. At first glance their websites look really legit. You fall in love with the picture, contact the scammer and begin to talk to them about purchasing the adorable little puppy. Eventually you send them a deposit via usually Western Union, and you suddenly never hear from them again. You never receive your puppy, because there was no puppy, and you just lost your money. These scammers often steal pictures from the Internet of the most irresistible dogs and puppies and post them for sale. For example, here is a blog on the same deceased Pekingese being sold over and over again: http://ravinwoodfarm.blogspot.com. The dog's name is Hershey and he passed away late 2005. A good way to determine if a picture of a dog or puppy posted for sale is really for sale, or is simply a stolen picture, is to ask the seller to send you a picture of that same dog or puppy with something in the picture that you can identify, such as a piece of paper with the date written on it, or even with your own name written on it. Beware of doctored pictures, so ask to see different shots of the same dog in different poses with your identifiable object in the picture. Because these scammers are running out of third-world countries, catching them is difficult to almost impossible. In order for you to prosecute the scammer, the country you are in would have to work with the country they are in. In most cases, the country the scammer is running out of is not willing to cooperate. The cost of prosecuting the scammer is very high and the country you are in will most likely not be willing to fork out the money. So what can we do about these scams? We can educate ourselves on how to detect them, and not fall for it. 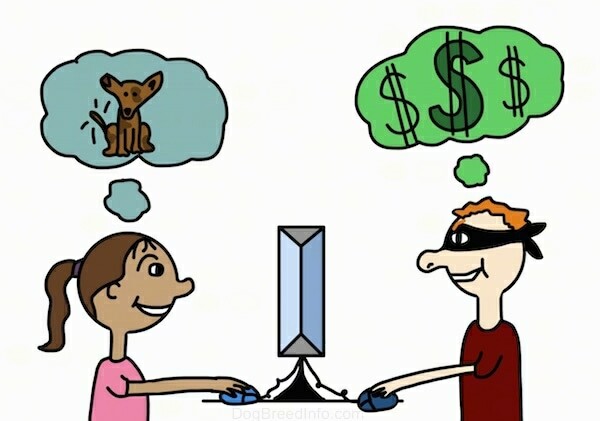 If scammers can't scam us, they won’t make money and we all know it's the money that is driving them to do it. Look at the website very closely for clues. For example, these scammers are stealing pictures from other websites and adding their own descriptions under them. One website pretending to sell Beagle puppies had a photo of a dog that was clearly not a Beagle puppy. They also had photos of male puppies and under the photo claimed the dog to be a female or vice versa. Ask to see more photos of the same puppy from different angles. Ask to see a picture of the same puppy when it was a few weeks younger. Can the breeder produce them? One reason these scam websites look so legit is because they are stealing text from real breeder websites. Copy and paste a sentence or two from the site in question into a Google search with quotes around the text, for example, if they have a list of references. The quotes tell Google to look for those exact words in the same order as you have typed them. If you find another website with those same exact words on it, a red flag should go up. Either the site you are investigating has stolen the words, OR they have had their words stolen from them. If the website has its own domain name and is not a free website such as GeoCities, etc., take the domain name address and go to www.DNSstuff.com. Put the domain name into the "WHOIS Lookup." Does the country in the domain name record match the address the website has as their contact info? Keep in mind, hosting companies are often within the same country as the site owner, but not necessarily inside the same state or town. They rarely, if ever, however use a company outside their own country. Does the website have a phone number down as a contact? And if so, have you been able to speak to a real person? Most scammers will not get on the phone. One, because their English is very bad, and two, the phone bill would be very high since they are in a different country than you are. Also, with caller ID, they do not want to take the risk you can tell they are not out of the area they claim to be out of. Some of these scammers pretend to be deaf or have another odd reason why they cannot talk, getting a relay operator to relay their messages for them. Relay operators are not allowed to reveal it is a scam. By law they can only relay the message without giving their own input. Take the area code of the phone number listed on the site and enter it into the Reverse Area Code. Does the area match the area the breeder claims to be out of? Copy and paste the email contact info into a Google search. Does anything else come up under that email address? A lot of times nothing will come up, and that really does not tell you anything. However, from time to time you will get results under an email address. Look at the results and where else this email address has appeared Internet. Looking at the Google cached pages can be helpful in viewing expired ad pages. Sometimes you will discover the same email address has claimed to be in many different areas of a country. For example, one email address may appear selling English Bulldog puppies out of New York State in the USA and also appear selling puppies in California inside the USA. This is a clear warning sign of a scam. Does the "breeder" you have contacted communicate in broken English? Since most of these scammers are working out of foreign countries, their English is not very good. They will usually have many spelling and grammar errors in their emails. A red flag should go up if the scammer will only take their payment via Western Union, or another odd form of payment. 10. If the breeder emails you look at the long header of the email for the "received from" IP number. Look up the IP number to see the area the email came from. If you have a bad feeling about a "breeder," it is best to steer clear. Go elsewhere for your purchase. If you use your common sense and do not ignore any warning signs, you can usually tell if it is a real breeder on the other end. Let’s not contribute to a scammer’s booming business. Have you ever had a puppy before? Will you send me pictures of the puppy when you have her? Do you have a vet you will take the puppy to? And will you treat her as your children? Will you have Enough time to spend and Play with them? Sorry for too many question,but i just want to be sure that my puppy will be going to the right home.so will be waiting to read back from your soonest mail. And below are the pictures of Tina is that ok by you?waiting to read back from your soonest mail. I do have a few questions myself first. This little girl Yorkie Puppy is 2.4lbs at 12 weeks* he is-Which is it? ..a he or a she? potty trained-at 12 weeks? THAT IS A MIRACLE! going for free-I will not even respond to this. I read the first few lines and knew it was a scam. I am aware of the website you stole these adorable pictures from as I and a few others belong to quite a few rescue groups. I will inform them and Craigs list that you are using them to run a scam. Also be aware that you are being reported for fraud. Mission? Your next one will be in a jail cell. Nice try sweetheart. Where are you located Glen? I am Beth by the way. VERY INTERESTED. Would get the baby fixed of course and are any shots been given? Gotten quite a few responses overnight too the ad but my mind keeps going back to your puppies. Sounds like a scam. And I already got a puppy this weekend thanks. Will turn you in just to make sure. Cute and lovely Pomeranian puppy for a home. We have a lovely Pomeranian puppy for a home.This puppy is vet checked and has just been vaccinated.This puppy also likes to play with kids,adults and other house hold pets.Contact us for more details if interested to have this lovely puppy to your home. Calvary greetings to you, Thanks for your interest in my lovely baby and .She is still very much available for new home.She is 12 weeks old,presently and She is AKC registered and her shots are given up to date,she is vet checked and potty trained.All her papers will accompany her, But right now i am in africa on a Christain mission with my wife and we have her right here with us.We are going to ship her to you via Express pets delivery on next day delivery after shippment through a shipping agent , i am leaving her for $200 Including shipping.If you are interested in having her, i want you to get back to me with your fullname,address including the nearest airport to you.Please if you know that you are not going to take very good care of my baby do not reply me because i am only giving her out becuase we dont have time to take care of her again due to the mission work before us here.Await your response. This sounds too good, so I have a few questions. Do you have x-rays or has this dog, or parents, been certified hip dysplasia free? What kind of health guarantee is there? What about a quarantine for animals coming into this country? Have the parents had cherry eye, and does this puppy show any signs of it? It usually does not show up until 3-5 months. How much is the shipping to Phx, AZ? Could you e-mail me copies of all papers? If all terms are exceptable I would have you ship C.O.D. only. Thanks for your response i want you to know that am so happy to read back from you and i want you to prmise me that you will be taking a very good care of my puppy as soon as you recieve her at your location,Regarding the shippment you will have to get back to me with your shipping information such as your full name address phone# and the nearest airport to you for delivery the puppy will be shipped out via AAAA cargo and you will be making the payment for the shippment via money gramm transfer directly to the shipping agent that will be incharge of the shipping and as soon as the payment is confirmed your upcoming family member will be shipped out asap on next day delivery. On 08/26/05 I e-mailed globalgiving99@aol.com who appeared in the English bulldog breeders list, for information about his puppies. On 08/27/05 he contacted me back with information and pictures about a puppy. He mentioned he had auditive problems and couldn’t use the phone. He has the Vietnam Veterans of America and POW/MIA Committee logos in all his e-mails. On 08/28/05 I e-mailed him back asking more questions about the puppy. This same day he answered back saying she was an 8 week puppy. On 08/29/05 I e-mailed him about my interest in buying the puppy and asking about the process to buy her. On 08/30/05 he e-mailed back his name, address, and saying that the payment for the amount of $1000 had to be done via western union. On 08/31/05 I e-mailed my concern about internet scams and asked if my friend who lives in Chicago could go by his house to check everything out. He answered the same day stating he was a 67 year old retiree and was home everyday so she could go by at any time. Because I was moving from Boston to Virginia at the same time, and because he answered like this, I never got around to actually having my friend go by. On 09/01/05 I e-mailed him that I was in the process of having my mom transfer the money from San Juan, Puerto Rico to him. He e-mailed back on 09/02/05 reminding me to send him the MTCN number from Western Union and the name and address of the sender in order for him to pick up the money. He also reminded me to send him the information of the airport were he had to send the puppy. He was supposed to send the dog to Virginia were I was moving to. On 09/03/05 I e-mailed him the information to pick up the money in a Western Union in Chicago,IL. The MTCN number was 000-000-0000. The sender was 'xxxxxxx', and the address was: 'xxxxxxxxxxxxx'. He e-mailed back the same day stating he would pick up the money the next Monday (09/05/05) and e-mail me back the information of were to pick up the puppy. After that e-mail on Saturday 3rd, I never heard back from him. I’ve e-mailed everyday but no answer. I called Western Union and he picked up the money that same day (09/03/05).